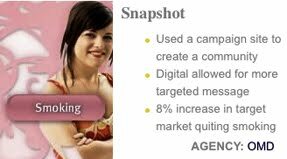 With the ultimate aim of decreasing the number of young women in Queensland who smoke, Queensland Health commissioned an advertising campaign specifically targeted to females aged 18 to 29 years. Many young women didn’t want to smoke, but couldn’t imagine getting through quitting and being a non-smoker. Loneliness was identified as a major factor for young women trying to quit smoking. Smoking represents symbolized stuff – prior work, stress, coping, short breaks – a sense of belonging. Fickle and difficult to reach market with a strong focus on appropriate cultural relevance and newness in their habits. Create a community where these young women can gain a sense of support and belonging. Create a communications piece symbolic of ‘wellbeing’ and ‘smoke-free’. The campaign resulted in an additional increase of 8 percent in target market quitting, which equates to 7,542 female lives saved. The campaign resulted in an additional 28 percent of current smokers with intentions to quit (26,397 females) – more potential lives saved. Lastly in terms of future intentions, 87 percent of young females in QLD intend to positively change their smoking behaviour in the near future.